First of all, what is a CRM? Are you looking for better ways to improve communication with your customers and potential customers? The success of any business or organization relates to its ability to properly organize and communicate with those who utilize its goods and/or services. Customer relationship management (CRM) is the label used for these operations. However, the term CRM applies more specifically to technological systems that handle these operations. A look at CRM's functions and benefits can help you decide if a CRM system is right for your organization. Check out this detailed blog post for more on "what is a CRM?" Learn about the difference between CRM, ERP, and marketing automation. Getting a handle on performance transparency will allow your top achievers to become identifiable very quickly; performers like these can receive the recognition that they deserve while those who consistently struggle can be pinpointed and offered additional support or training. CRM means that there's no excuse for your team to lag behind on report preparation. Because accessing and analyzing reports is such a cinch, you'll never need to worry about your team coming into meetings unprepared-- weekly and monthly sales reports become their responsibility to locate and bring to you. When you're looking to make critical business decisions, it's imperative that business data is easily retrievable and a breeze to understand. When you elect to take advantage of a CRM, all of your business' relationship and process data become available via one single interface. This makes educated and timely decisions a part of your routine business dealings, rather than cause for massive projects and meetings. The right CRM will help you and your team craft daily, monthly, and long-term schedules that contribute to your business' growth. With a wealth of information at your fingertips at any given time, it's easy to use a CRM to help you understand how to prioritize work and get in control of tasks. These capabilities will also allow your sales team to get out and do what they should be focusing on-- selling-- while CRM handles time management behind the scenes. Check out this blog post to read more about the benefits of a CRM for manufacturing. Once you've decided you need a CRM or need to change out your existing CRM, it's important to set some evaluation criteria. There are hundreds of options available. A false start can be devastating to your business. One of the biggest hurdles to implementing or changing a CRM with any manufacturing sales team is adoption by the team. If your team refuses to use the CRM, all is for naught. Why are we purchasing a CRM? What business problems do we hope to address? What specific business processes are we implementing with the CRM? How many users will we have? How many contacts do we expect to add to the CRM? Where is the contact data stored now and will we be able to add it to the CRM easily? What other systems will we need to integrate with the CRM? How much budget do we have to spend? Does the CRM vendor have experience with manufacturing organizations? Check out this post by HubSpot for more detail about selecting a CRM. Check out this post by Manufacturing.net too. Is there a cost per seat? Is there an additional cost for various levels of support? What is the cost to integrate with other systems? Will the monthly fee include a dedicated support person? How are the different features separated by price levels? How does the monthly fee increase with the number of contacts in the system? Will you be charged for training? Salesforce.com is the most popular CRM. As an example of CRM pricing, the Salesforce Enterprise version price is $125 per user per month. 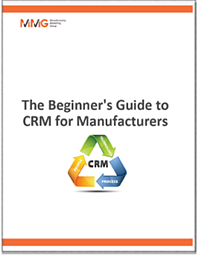 For a manufacturing sales team of 10 people, you would pay $15,000 per year for the CRM. HubSpot offers a free version of their CRM which is really $0 per user per month. The Enterprise version price is $1,200 per month and includes up to 10 users. Manufacturers should also consider the opportunity cost of a failed project and the cost of not implementing a CRM. When a manufacturing CRM software outlives its usefulness, it is best that it be switched out. This can be quite an extensive and tedious process. Besides, the bigger a company is, the more expensive it will be to switch out the manufacturing CRM. Since many CRM is usually intertwined with other company systems, switching out can be quite expensive. When basic activities take longer than usual, this might be a sign that your manufacturing CRM has outlived its usefulness. It would be best if you had quick and reliable software that allows salespersons to make quick transactions to increase productivity. Decision-making is an integral part of running a manufacturing company. When your sales team depends on Google sheets to keep track of sales leads, then there is a problem. A centralized source of information ensures that the company can make critical business decisions on time. An outdated CRM software is bound to have limited functionality. An updated software incorporates all the new technological advancements to ensure salespeople have an easy time keeping up with day to day operations. Outsourcing when it comes to consultancy services for even the smallest changes in the company can drive up running costs. A manufacturing company's CRM software requires constant evaluation to ensure it can sustain all the needs of the company. Even though as a growing manufacturing company, you need to price your services as you value them, it's not possible to retain a high customer retention rate with degrading provider services.